I love technology. I love reading about technology. I love reading about technology that doesn't exist quite yet. Enter CES. 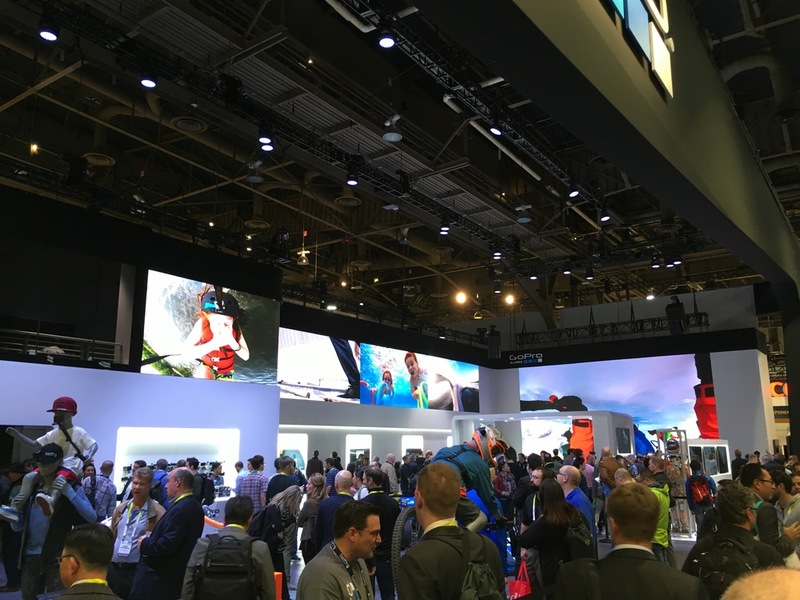 The Consumer Electronics Show is an annual tech bonanza hosted in sunny Las Vegas, Nevada. It isn't just a electronics show, it is the electronics show. 170,000 attendees from every corner of the globe gather for what is largely the epicenter of consumer tech reveals. More cool things are announced during the week of CES than any other. 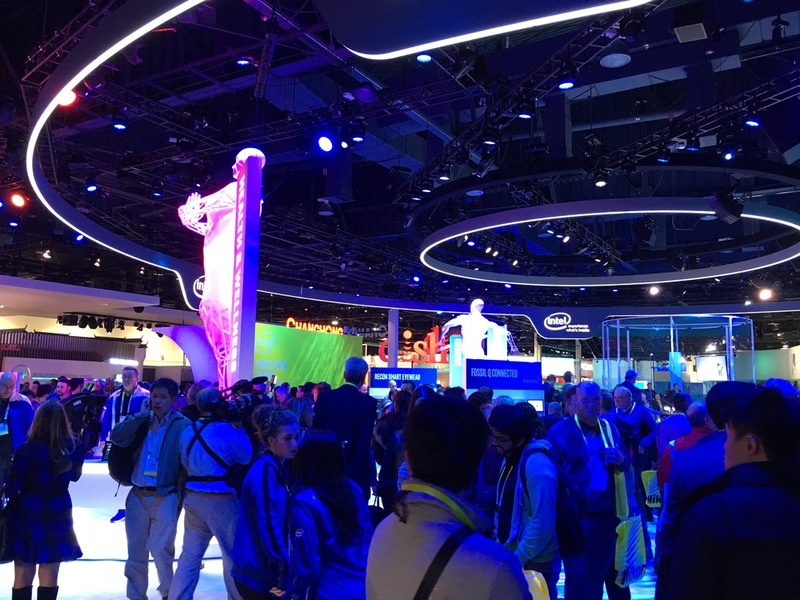 Microsoft, Intel, Samsung, Sony, LG, Nvidia, and every other major tech powerhouse (with the notable exception of Apple) come to show off their latest and greatest wares. This year, I had the incredible opportunity to actually attend the show. It's been a long held dream of mine to attend an event of this caliber (E3 and WWDC, you're next). Actually doing so was a blast -- here's some of the craziness that lined the show floor. If a picture is worth a thousand words, then this is going to be a very wordy blog post. Let's just get this out of the way: We've done it folks. The smart rubber duck is here. We can all go home. Moore's law has nowhere left to go. No expense is spared at CES. Companies erect temporary monuments, adorned with infinite rows of LED lights and branding materials. Many of these displays clearly cost hundreds of thousands of dollars -- and somewhat depressingly, they exist only for a few short days. Intel literally designed an arena. 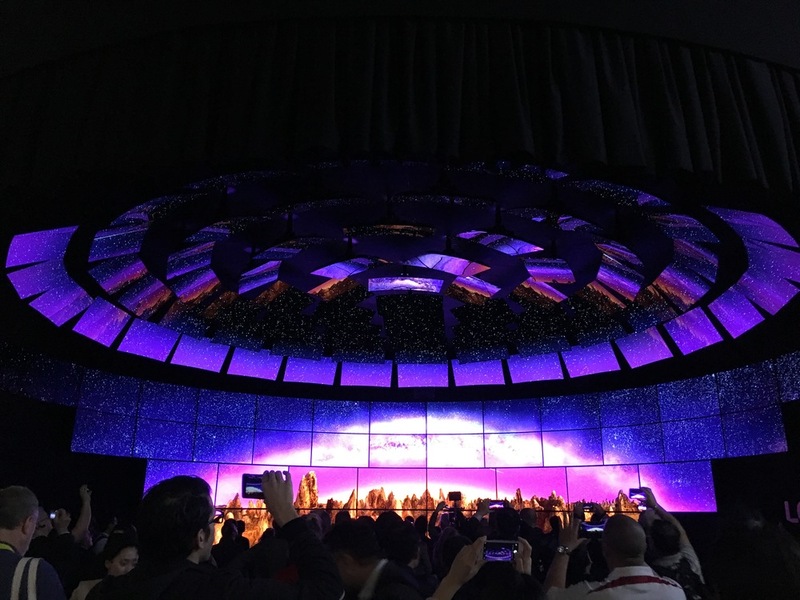 Samsung created a small metropolis, complete with amusement park-esque Gear VR experiences. Oculus built a building the size of small department store, and Sony created a wonderland the size of a baseball field. Even the United States Postal Service showed up! Thank you USPS, for your desperate attempts to innovate. 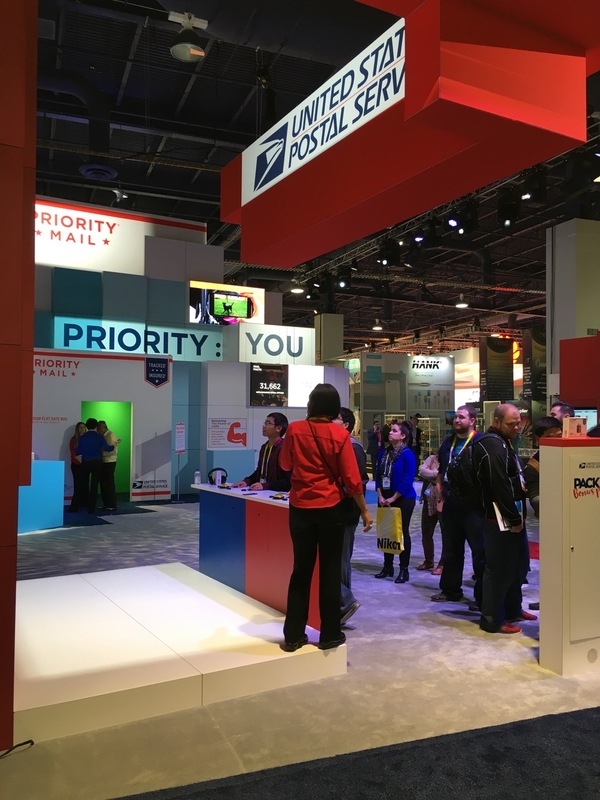 I enjoyed the two story postage themed Tetris game that you created. May our tax dollars subsidize even larger Tetris games in the future. If anything, I wasn't expecting the pristine level of craftsmanship on display. These companies must get quite the return on investment, because the resources necessary to bring these things together are clearly tremendous. Hello, 4K. It's nice to meet you. Seriously, 4K is going to be hitting HARD the next couple of years. No one is showing off 1080p TV's anymore. No one. I'm sure that they'll still be on the market for a while (due to price and lack of 4K content), but the timer is ticking. 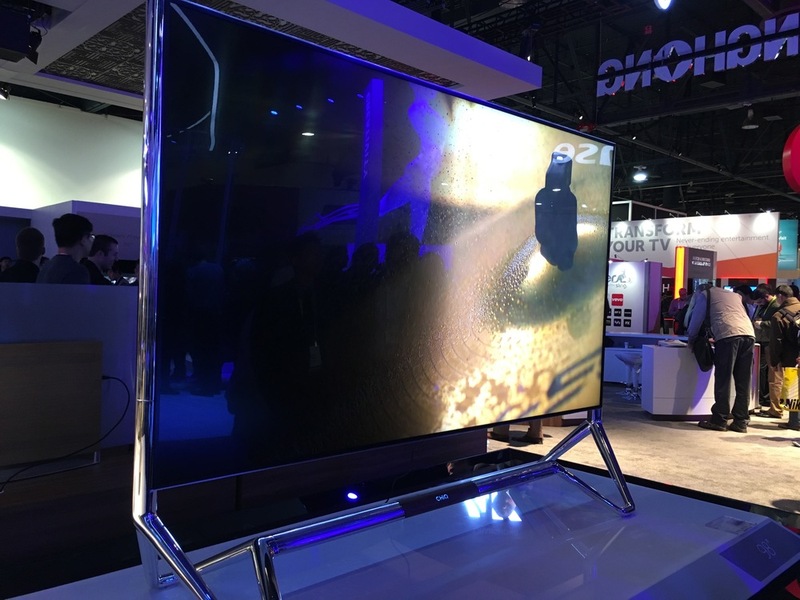 The 4K tech that was on display looks substantially better than traditional HDTV. Absolutely worth upgrading to. This is especially apparent in OLED and Quantam Dot (whatever that means) models. While the additional resolution adds a great deal of clarity, the biggest improvement comes in color reproduction. They look gorgeous -- it is really something that must be seen in person. If your local Best Buy has a 4K OLED TV on display, give it a look. It'll change your life (and your wallet, if you've got that kind of money). Remember 3D TV's? They were all the rage for a bit, but they essentially lived and died in a five year period. 3D was almost entirely absent from the show this year, and I don't think that it's coming back. I genuinely think that 4K is different. Notable was LG's giant space-age dome of curved panels. Upon seeing the display, my wallet jumped out of my pocket, had a heart attack, and died. I mourn the loss of my wallet, as well as the brain cells lost trying to imagine how much the TV dome cost. There were also some 8K TV's, but I'm not ready to talk about those yet. That number of pixels makes me uncomfortable. Do you like cars? Here are some cars that may or may not actually be from outer space. However, such flashiness is meaningless. Humanity has already been blessed with the perfect automobile: The 2004 Buick LeSabre. I don't envy the vain attempts of automobile manufactures to outdo the almighty 2004 LeSabre. Its beauty is timeless and everlasting. The Playroom Demo: I strapped this thing to my face, and took on the persona of a virtual cat. The cat's eyes became my eyes as I looked around a large virtual kitchen. Other players sat around me with regular Playstation controllers, each controlling a mouse. It was my job to find the mice, and pounce on them. There I am, lurching my face all over the place (and looking like a complete idiot) in this virtual kitchen. It was extremely creative, and very much unlike anything I have ever experienced. It was more gimmick than gameplay, though that was perfectly suited to test driving the tech. The London Heist Demo: This is where things got interesting. I waited in line a long while to try this, and it was well worth it. After strapping the PSVR to my face, I was given a pair of headphones, and two wand like controllers (see pictures for an example). You are transported to a virtual library, and placed in front of a virtual desk laden with drawers and cabinets. The wand like controllers work like hands -- you can actually dig through the virtual desk in 3D space. After a bit of tinkering, I found a gun in one of the drawers. A group of enemies then raided the library, and began to shoot at me. Instinctively, I ducked behind the virtual desk. There was no desk. From outside, I looked completely ridiculous. I was ducking in the middle of an empty space. This is what makes VR so compelling. To the player, the element of realism is unparalleled. My one complaint with PSVR is image quality (though, to my knowledge I was using a prototype). It was a noticeably blurrier than the two VR headsets listed below. However depending on the cost of the final production unit, that may be a welcome trade off. No price information is currently available. 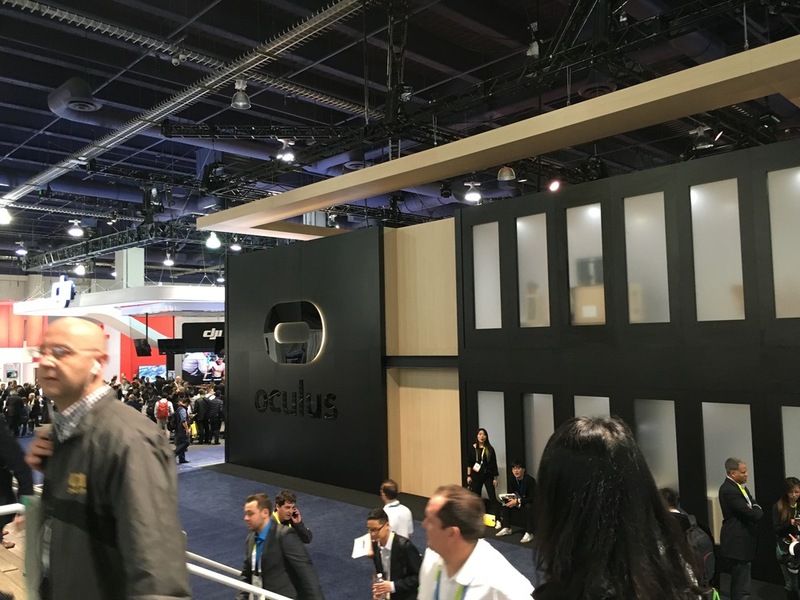 The Oculus Rift was the most impressive thing at CES 2016. I haven't been this impressed/surprised by a piece of tech in many years. Aside from being totally unlike anything else on the market, it was the highest quality VR solution available at CES. The seemingly exuberant $600 sticker price got people really curious, myself included. After my (7 minute) demo with the device, I understand both the hype and the price tag. The display quality is extremely high, and there was no discernible latency when the Rift was recognizing my movements. I played two demos: Edge of Nowhere and Eve: Valkyrie. Edge of Nowhere was particularly impressive. I controlled an explorer traversing a snowy mountain pass. After entering a cave, I was greeted by numerous bottomless pits. Upon leaning over to veer into on of these pits, my stomach immediately lurched and my head dizzied. This reaction was totally involuntary. My brain was "tricked" (of course, in reality I'm staring down at a neatly carpeted booth floor). That sort of immersion caught me totally off guard. Evidently, people often fall over/trip because it is so difficult to avoid being "transported" into the virtual space. Unfortunately, running this thing requires a really beefy PC (in excess of $1000). That's a hefty price of admission. It will be interesting to see where pricing goes as the technology gets a bit more seasoned. If you have the opportunity to try an Oculus Rift, do so. I have little to say about the HTC Vive. My 10 or so minutes with the device (playing the space flight simulator, Elite Dangerous) were enjoyable, though not as technically impressive as the Oculus Rift. This can be mostly attributed to the in-game frame drops, which are especially disorienting in VR. The unit that I tested was a developer kit, so I imagine that a range of improvements will be made before the consumer release in April of this year. I was unable to test the more advanced spatial/depth features, which allow tracking of a user throughout an entire room. In addition to all of the cool stuff, there is an endless sea of glorious knockoff foreign gadgets. I bet there were about 500 exhibitors that meant to go the PIC (Patent Infringement Convention), but accidentally ended up at CES. Perhaps you're interested in the "Fruit Watch" (a cheap looking Apple Watch clone that runs Android)? No? I walked more than 15 miles each day. The show floor is HUGE and spans two different convention venues. It's hard to see it all.